Quality product! Makes a big difference to the taste of the water. Less chemical / chlorine taste and brings out the natural sweetness of the water....at least where we are. Not exactly cheap but worth it to not have as much chlorine and/or lead and/or whatever else your local authorities decide to put in the water. Very happy with my purchase. No complaints, at all. Highly recommended. I bought this for emergency use as I live in an area where water has to be pumped. When the electric goes off so does my water supply. It is a nicely made unit and I'm pleased with it. Pricey for what it is, though I expect it will be worth it's weight in gold at some point in the future. I would recommend the product and the retailer who sends at no extra cost. It is also £12 cheaper by getting direct and cutting out the middle-men. :) Thanks for a good online experience, I'll be back for spare filters soon. 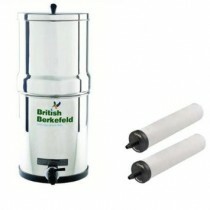 I ordered my British Berkefeld gravity purifier from Finerfilters as it was cheaper than anywhere else and free delivery too. Mine included 2 of the higher spec ATC Super Sterasyl filters. You can fit four filters which will give you a faster flow rate into the lower chamber which is suitable for larger families requiring more water more often. But I've fitted just two filters in the upper chamber and have two purchased 2 filters to hold in reserve. That's more than adequate for my needs. Set up was easy and took less than five minutes. My water supply can taste and smell strongly of chlorine and maybe hypochlorite at times. At worse it can smell almost like mild swimming pool water. Other times it's clear and tastes of nothing but it is quite hard. The setting up is easy but requires a bit of patience, basically soak the filter candles for 3-4 hours then fit the tap and candles and run a full load, throw away the filtered water as there should be some ceramic sediment come out. Do a second batch and leave that overnight. Throw that water out and the next batch will be good stuff. It literally tastes like pure water. In coffee machines and making tea, the taste is much better too.